My apologizes for the lack of posts lately! The past few weeks have been busy with holiday gatherings and ringing in the New Year. I hope you all had a happy and healthy holiday season! This Christmas I received many baking and kitchen related gifts. But one of my favorites was from my adorable niece, Emma. She gave me this Bake Pop maker along with Bakerella’s Cake Pops book. I’ve had a few various cake pops pinned and always wanted to try my hand at them. The Bake Pop is the product you may have seen on television or advertised along the side of various blogs. 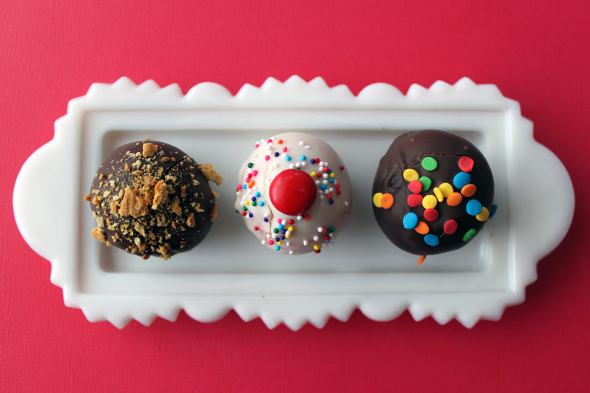 It’s a bit different than Bakerella’s version of cake pops. And thankfully it’s much less time consuming. The nice thing is that you can still use most of Bakerella's decorating ideas. For my first attempt at these, I used some box mix and prepared it using the suggestions from Bake Pop. They recommend using milk instead of water and halfing the amount. Also, they suggest adding an extra egg to the mix. Once the batter is prepared, pour it into the bottom greased pan. I think I may have over greased! Cover with the greased top pan and seal shut with the provided clips. Bake according to the directions. I overfilled my pan a bit and some cake poked out the top. Allow the cake to cool and then remove the top pan. Do you like that cute plate? Grace gave it to me as part of my Christmas gift. The Bake Pop came with sticks to make them into cake pops, but I didn’t have any Styrofoam or a stand to stick them in while they were drying. So for my first attempt at these, I just made them into regular cake bites. Looking at this photo I realize my dipping skills need some work. I kept these simple and just dipped them in melted chocolate and put some sprinkles on top. My real goal was to just see how the pan worked. Next time, I’ll try some of the decorating ideas I’ve seen on Pinterest and in the book. The Verdict: These were very easy to make and really cute. The taste of the cake could use some work. It was a little spongy and just tasted off. Next time I make these; I will just make them as directed on the cake mix box and see how that goes. The extra egg definitely changed the taste. 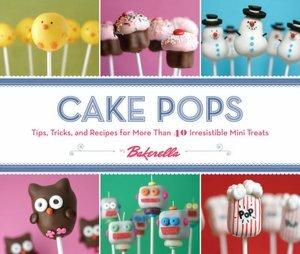 Things to Note/Consider: The Bake Pop pan makes 18 cake bites. You can get at least 25 cake bites from one box of mix. Also, be sure to watch your bake time. The bottom half of the cake cooks a bit faster than the top and they can burn quickly. I was really surprised at how large the cake bites were. I guess I’m just so used to the smaller truffles I’ve been making. 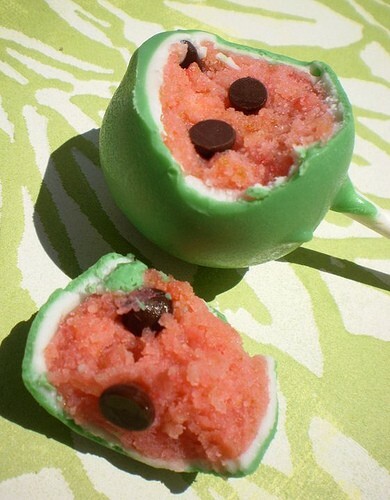 Just today I pinned this watermelon cake pop idea. I can’t wait until summer to try it out! These look so yummy!!! I got a bake pop for Christmas... now I can't wait to try it! I, too, have been wanting to try cake pops. Yours turned out really well! I may have to buy a pan and give it a try soon. They are too cute! I have been seeing these around, always wanted to try them out.. Your recipes looks good and cute too.. I am bookmarking.. Thank you all for checking them out. They are really cute and I'll defintiely be making them again. Be sure to share your results when you give them a try!